July 24, 2012 - With gasoline prices continuing to be near record highs, many area families will enjoy an affordable “staycation” close to home this summer at the 30th annual Quick Chek New Jersey Festival of Ballooning. The three day Festival, July 27-28-29, 2012 at Solberg Airport in Readington in Hunterdon County, features twice a day mass ascensions of more than 100 sport and special shaped hot air balloons from around the world, live concerts, and 39 hours of family entertainment and attractions. The largest event of its kind, the Festival has been named one of the Top 100 Events in all of North America five times and the number one thing to do in New Jersey in 2012 by New Jersey Monthly magazine. In addition death defying stunts from the Red Bull Air Force sky diving team along with hundreds of arts and crafts and food vendors, many of whom will be giving out free samples and products when you stop by their booths. Special shaped hot air balloons include a new signature balloon from Quick Chek, which in the past has been a giant farm house or 135 foot tall eagle; the 5-story tall PNC American Flag, the world’s largest free-flying American Flag; an 86 foot tall replica of Darth Vader’s head from Star Wars; the 110 foot tall Unique Photo SnoBird tourist penguin; and a 110 foot tall Pepsi can. New special shapes include an 80 foot tall, bright pink elephant and a ferocious Tyrannosaurus Rex that’s the size of a 12-story building. And no celebration would be complete without a cake: the Cake balloon is 80 feet tall, 71 feet round, with 12 foot high candles, five foot high flames and weighs a whopping 807 pounds! The Festival also takes the 5K race to new heights with the 3rd annual Trinitas Regional Medical Center “Running with the Balloons” 5K race and Family Fun Run, in which runners race through the Festival grounds with balloons overhead on Sunday morning, July 29. 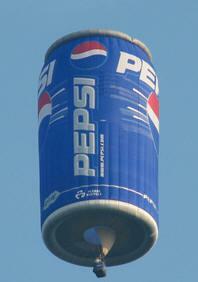 And yes, you can go up, up and away in your beautiful balloon. Nearly 1,000 people will take a ride at the Festival this year, from adventurers to romantics alike ($200 per person morning, $225 per person evening, advance purchase suggested as rides sell out); please note that all balloon activity is wind and weather permitting. Death-defying aerial thrill show keeps eyes in the skies. The action will remain in the skies before and after the balloons have taken flight. The Nerveless Nocks, an incredible troupe of world champion thrill performers from Switzerland’s oldest circus family, will perform death-defying stunts. 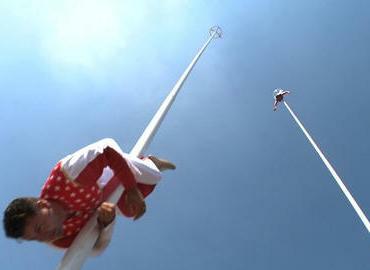 The Nocks, who date back to 1840, have earned universal acclaim for their daring Sky High Sway Pole Show, in which they climb and perform atop 80 foot tall skyscraping sway poles completely free of guy wires and safety nets. The whole family will enjoy these sensational thrill performers, who climb hand-over-hand to the top to perform a variety of acrobatic aerial acts. The Nocks also perform an unbelievable and risky mid air exchange from pole to pole and an incredible headfirst free-fall back to the ground. They’ll also perform stunts and a balancing act atop a 20 foot tower of stacked chairs. The Nerveless Nocks have nine generations of entertainment experience. They have been featured in feature films, television shows and commercials, as well as produced, directed and designed many popular theme park stunt shows and special event action shows worldwide. “We’re proud to add the Nerveless Nocks as a new attraction to our big 30th celebration,” said Festival Executive Producer Howard Freeman. “We’re always looking to add to the enjoyment of our Festival-goers and add value to their Festival experience. This is something the entire family will enjoy.” The Red Bull Air Force sky diving team will also be returning to the skies over Hunterdon County, performing tandem jumps high above the crowds at Solberg Airport. The three-day festival, the largest summertime hot air balloon and music festival in North America, features twice a day mass ascensions of more than 100 sport and special shaped hot air balloons from around the world taking flight at 6:30 a.m. and 6:30 p.m. The Nerveless Nocks and the Red Bull Air Force sky diving team, who will each perform multiple times each day throughout the weekend, are among the many featured entertainers and attractions at the Festival, which offers 39 hours of morning-through-night family entertainment. For the price of admission, Festival-goers receive unlimited daily access to the mass ascensions of more than 100 hot air balloons taking to the skies, lawn seating to concerts by ‘70s rocker Eddie Money (“Two Tickets to Paradise,” “Take Me Home Tonight”), Motown legend Smokey Robinson, rock and reality TV star Bret Michaels, and teen sensations R5 featuring Ross Lynch from Disney Channel’s #1 series Austin & Ally, lawn seating to a performance from the ICONic Boyz dance troupe from MTV’s America’s Best Dance Crew, a fireworks extravaganza with nighttime hot air balloon glow where balloons are inflated and lit up like lanterns.